I think the description of this book sold a story that the author didn’t really deliver for me. Set in the mid to late 19th century young Hugo Delegate sets out west with his family to check out his father’s silver mines. While they are out exploring they stumble across an exhibition that draws them in. A savage girl raised by wolves is on display and Hugo’s father decides to take her home and make her his project. The Delegate family resides in New York and is extremely wealthy. They take savage girl in (we later learn her name is Bronwyn) and attempt to raise her as their daughter and introduce her to society after some guidance and formal training. The novel had an interesting premise but I don’t think it was sold that well. I listened to the audiobook and that may have had an impact on my feelings toward the text. It just seemed to have too much going on and just seemed too far-fetched for the marketing of the book. If you’re a fan of Zimmerman or have been wanting to read this book I’d still suggest you check it out. It just didn’t impress me much. Lesslie Newbigin’s influence in the contemporary church, particularly with regard to thinking about ecclesiology and the missional nature of the church, is profound. This collection of essays looks at the legacy of the missionary bishop from three different angles. In the first section, “A Way of Doing Theology,” the essays look at the methodology behind Newbigin’s theology, including his ecclesiology, his preaching, and his approach to the interpretation of history. The second section, “Theology in Western Context,” deals with Newbigin’s critique of Western culture and his understanding of how the church can effectively witness to the gospel in a post-Christian culture. Finally, “Theology in Global Context,” looks at Newbigin’s engagement with world religions and examines how his ecumenical legacy informs the issues that the church faces today. This book is certainly important in the sense that it helps to illuminate a figure whose influence in the church is so expansive. The essays are well researched, and they cover the most important aspects of Newbigin’s life and ministry. Some of the chapters on ecclesiology became a bit repetitive, but on the whole they were helpful. Theology in Missionary Perspective is a useful tool for contextualizing Newbigin’s themes, and I found Mark T. B. Laing’s essay “The Indian Church and the Formation of Lesslie Newbigin’s Ecclisiology,” particularly good in this respect. This second volume of “wordless novels” by Lynd Ward is made up of two shorter stories or movements and one long novel. Prelude to a Million Years depicts an artist who desperately pursues his ideal of beauty in the midst of the despair and chaos of the Great Depression. In Song Without Words an archetypal women wanders through a world corrupted by capitalism and fascism. She despairs of bringing a child into such a world, but in the final scene, she holds her newborn child in her arms as she and her husband gaze past the dark city and look to the horizon in hope. Vertigo is the longest of Ward’s novels. It follows three characters, “The Girl,” “An Elderly Gentleman,” and “The Boy.” The story critiques the failures of capitalism as it shows how each character is effected by the Great Depression. As in the first volume, all of these woodcuts are beautiful and intricate. There is something particularly appropriate about the black and white medium for expressing the despair and fear of American society during the Depression. The shadow is cast not only by a devastating economic crisis, but also by the rise of fascism in Europe. The contemporaneity of these themes and the sophistication with which Ward utilizes such an old technique combine to give the images in these novels a very modern feel. They may in fact be forerunners to what we now call graphic novels, but I wonder if any contemporary graphic novels can actually rival their effective use of this visual storytelling medium. Each novel in this collection consists of a single woodcut per page without any text. These “wordless novels” were early forerunners to today’s graphic novels. Lynd Ward’s visual stories deal with themes like the role of the artist in society, the consequences of industrialization, the plight of the worker, the failures of capitalism. In Gods’ Man a young artist arrives in the corrupt city and makes a Faustian deal with a mysterious stranger that results in his rise to the top of the art world. He eventually flees the city and finds love in the country, but the deal he struck ends in tragedy. In Madman’s Drum, a murderous slave trader returns home with a demon-faced drum, bringing with it a curse that sets the man’s family on a disastrous trajectory. Wild Pilgrimage follows a factory worker as he leaves behind the dirty and violent environment of the factory for the unsullied countryside. However, he finds hatred and violence even in this rural setting, and he returns to the factory to lead a worker’s rebellion. The woodcuts that make up these novels are beautifully executed and remarkably detailed. In Gods’ Man, the ominous shadows cast by looming skyscrapers communicate the corrupting influence of the city on the idealistic artist. The faces of the characters in Madman’s Drum are remarkably expressive. In Wild Pilgrimage, Lynd alternates black and white woodcuts with red “dream sequences” to communicate the reality versus the ideal of a socialist agenda. God’s Man has a strongly allegorical feel. It is the simplest of the stories, and it flows smoothly. The images in Madman’s Drum are more complicated. The story is more complex and it is not easy to follow at every point. The collection includes an introductory essay by Art Spiegelman which helps to contextualize Ward artistically and socially. 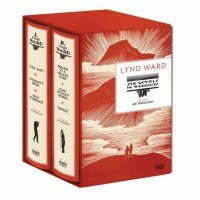 In the back, there are three essays written by Ward that correspond to each novel. These are very helpful, both for making sense of some of the more difficult parts of the stories and for appreciating the artistic techniques that Ward employs. Jon Canter writes funny, insightful novels. Worth tells the story of Richard and Sarah, a couple who meet and marry in London. They soon decide to simplify their lives and move to the country. Adjusting to life in the Suffolk village of Worth proves difficult until Catherine moves into the cottage next door. She is the perfect neighbor – kind, considerate, intelligent, and fun. However, as the friendship between the three deepens, complications arise. No matter how far from the crowded city Richard and Sarah get, the difficulties of relating to and living with other people cannot be escaped. Canter seems to enjoy writing about intelligent but under-achieving male characters. In his first novel, Seeds of Greatness, it was David, the Cambridge educated bookstore clerk. In Worth, Richard is an aspiring but as yet unsuccessful illustrator who seems to be content to cede control of his life to the driven and ambitious women that surround him. The book sees Richard attempting to correct this dynamic with Sarah, and it provides lots of humorous and observant passages about how a couple can share a life without eclipsing one another. There is also some pretty funny material about the pitfalls faced by a married man attempting to navigate a friendship with a woman who is also close to his wife. It seems that Richard and Sarah’s relationship is defined almost as much by how they relate to their mutual friends as it is by how they relate to each other. I enjoyed this book a lot, though I found the final chapters a bit anti-climactic. In some ways, this probably makes it a story that is true to everyday realities. Some exciting and dramatic things happen, but these events tend to get absorbed in the more mundane and determinative events and decisions of life. On the whole, really enjoyable. The pills help her manage the realities of her good-looking life: that her husband is distant, that her daughter is acting out, that her father’s Alzheimer’s is worsening and her mother is barely managing to cope. She tells herself that they let her make it through her days… but what if her increasing drug use, a habit that’s becoming expensive and hard to hide, is turning into her biggest problem of all? I’d never read any of Jennifer Weiner books but I was told that she was a pretty good writer. And I did see the movie version of her book In Her Shoes, which I thought was very good. So when I saw this was her latest book it sounded pretty interesting to me. I have to say I was impressed with her writing style and the subject sparked my interest as well. I have known a few people with prescription drug addiction and saw firsthand the struggle they had to deal with to overcome it. Her story is compelling and well-written. I would love to know the type of research she did for this story because she seriously did her homework. Allison is real. She can be any one of your friends or neighbors; she could be any one of us. I traveled on her journey rooting for her to find a way to pull herself together and in the end, she did. It was not easy for her, though. Which in real life it’s not. I found it hard to put down. This book gave me a completely new insight to addiction. I don’t understand how someone quits or why they relapse. I know it is fiction but it was really well written. It wasn’t a depressing book and she even had some very funny moments in it. While it’s easy to see how Allison’s life spiraled out of control, you can’t help but root for her recovery. I have to admit, I was a little disappointed with the ending. For a story that had so much intrigue throughout, the end was kind of blah. I can see myself definitely reading another one of her books, though. Annie and Orion Oh were married for twenty-seven years and had three children together before Annie decided to leave Orion for a woman, Viveca, after moving to New York for her art. Now the family is set to come together once again for Viveca and Annie’s wedding but some of the Oh’s are having trouble adjusting to Annie’s new life. As they begin to gather on the east coast, Orion and their children, Andrew, Ariane, and Marissa, bring along new secrets while Annie continues to try and hide truths from her childhood. I truly thought this was a fantastic read. I loved the family drama and how Lamb set up the story. The reader knows right away that Annie and Orion’s marriage fell apart and everyone is having a little difficulty handling it. But it isn’t until you get each character’s perspective that you realize how badly they are taking the new family dynamic. For me, the story just kept pulling me in from different angles and especially the cliffhanger Lamb sneaks in right in the middle of the story. I’m always curious how other readers enjoyed books and I like to see what their thoughts are. The consensus I got from the reviews I read is while this was a good book, it still doesn’t measure up to Lamb’s previous books She’s Come Undone and I Know This Much Is True. Since this is the first book I’ve read of Lamb’s, I can’t imagine it will be long till I pick up one of his past reads.